Saudi-led strikes on Houthi arsenal send shrapnel flying into neighborhood, while Houthis shell UN aid ship seeking entry to Aden. Saudi-led coalition airstrikes on Monday targeted weapons caches of the Iran-backed Shi'ite Houthi rebels just outside Sana'a, the capital city of Yemen, placing the city in danger. The Mount Noqum military base on the eastern edge of Sana'a was targeted in the strike, with explosives and shrapnel sent flying by the blasts into an adjacent residential neighborhood according to witnesses speaking with AFP. Aside from the capital, the Saudi-led strikes also pounded the Houthis in Daleh governorate and other regions of the country. However, the violence was not one-way against the Shi'ite rebels who seized Sana'a last September and have sought to extend their rule over the country. A UN-chartered ship bearing humanitarian aid to Yemen was shelled as it approached the key southern port of Aden on Sunday according to a provincial government official. He said Houthis were responsible for the shelling, noting they have conquered several neighborhoods in the strategic port city. "The Houthis fired shells at a ship chartered by the UN that was carrying 7,000 tons of food...when it was within a nautical mile of Aden's port," reported the official, adding that the ship was unscathed. "The ship was forced to turn back and by night time it was about five to eight nautical miles from Aden." A port official confirmed the report of the shelling of the ship, which reportedly had set off for Aden from Djibouti. The port official accused the Houthis of "imposing a food blockade on areas of Aden under the control of the Popular Resistance Committees," which is a coalition of pro-government fighters, Sunni tribes and southern separatists seeking to reestablish South Yemen, a Socialist state that fell in 1990. 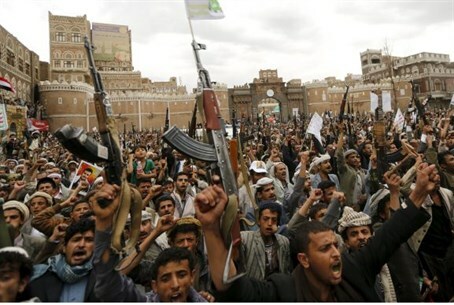 The Saudi-led coalition is seeking to restore the UN-backed President Abdrabbu Mansour Hadi to power, while on the other side are the Houthis and forces loyal to former leader Ali Abdullah Saleh. According to the World Health Organization (WHO), already nearly 2,000 people have died in the conflict in Yemen and another 8,000 have been wounded.